Each fall, hundreds of visitors flock to Boston to watch the leaves along Beacon Hill’s iconic cobblestone streets erupt into various hues of orange, red, and gold. Around the same time, bibliophiles (and erstwhile tourists) visit the Boston Book Festival in Copley Square to peruse tents filled with poetry, memoir, YA, fiction, and nonfiction, as well as literary magazines and local publications. The Boston Public Library provides a perfect backdrop for this celebration of Boston’s vibrant literary scene, and the diversity in featured voices (some Pulitzer Prize winners, some budding poets) makes the festival appealing and accessible to readers across the board (past speakers have included Colson Whitehead, Susan Minot, Lemony Snicket, and Joyce Carol Oates). In a valiant attempt to unite Bostonians over something other than a shared hatred for the MBTA’s Green Line, BBF chooses a short story by a local author that is printed and distributed at various bookstores and libraries each year, free of charge. The project’s name, One City One Book, underscores the city’s commitment to preserving and promoting its literary identity. With over 50 colleges and universities in the Boston area, it’s easy to wander onto a college campus (whether your nose is buried in a book or not), many of which have libraries holding fascinating collections. MIT’s archives and special collections has over 260 boxes of Noam Chomsky’s drafts, notes, and otherwise unpublished materials, in addition to a rare first edition of Walt Whitman’s Leaves of Grass. 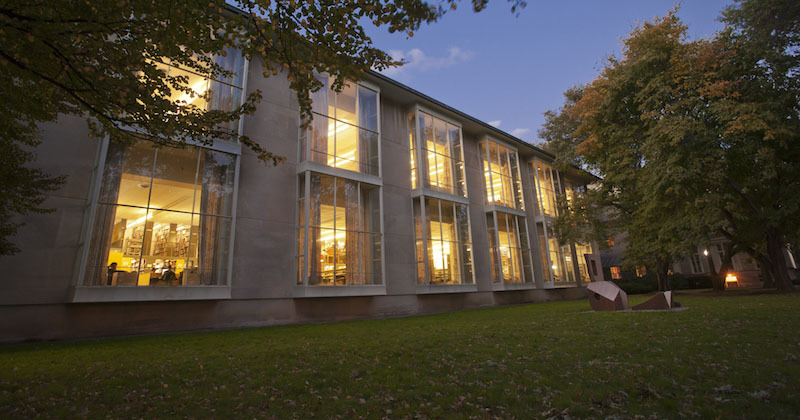 MIT’s founder, William Barton Rogers (you’ll find his name inscribed across the school’s marble dome building on Massachusetts Avenue) also has a personal library on campus, which contains his copy of Newton’s Principia. If you make your way straight down Mass Ave, you’ll eventually reach the Cantab Lounge. This hole-in-the-wall dive bar is easy to miss, nestled between an unassuming pizza joint and a 7-Eleven. It hosts the Boston Poetry Slam in its basement every Wednesday night. On Friday evenings, you’ll catch Slammers and fans alike listening to live music at Club Bohemia downstairs. It’s cash only and there’s almost always a cover to pay, but the pours of house wine and beer are generous (and affordable), and you may get to rub shoulders with some of Cambridge’s literary mainstays like Jackie Perry, Simone Beaubien, and Evan Cutts. Trident is known to many as a safe haven for the city’s college students who have had a bit too much to drink and need to bury their sorrows in a potato chuckwagon (a basket of potatoes doused with cheddar, meat, veggies and fried eggs). The two-story café and bookshop has ample table room, and Trident carries some of those coveted magazines that you won’t find on any old newsstand (think frankie, n+1, and the gentlewoman). The booksellers rank the current top ten best-selling books at the front of the shop with descriptions and witty commentary, intended to benefit the indecisive shopper and the bored Back Bay resident just ducking in after a long day shopping on Newbury Street. 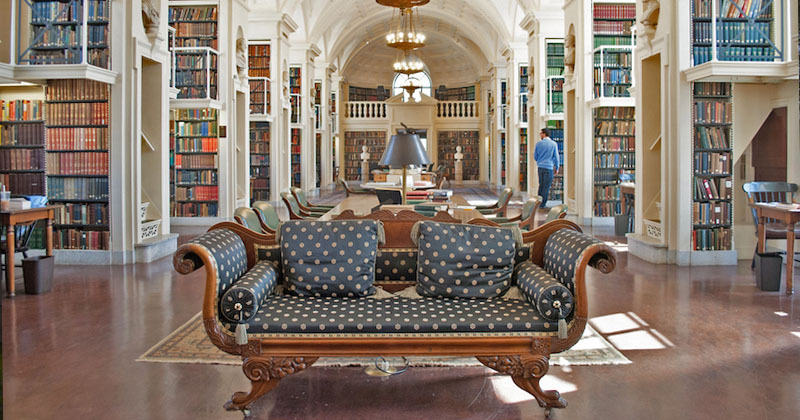 Now a National Historical Landmark, the Boston Athenaeum was founded in 1807, thanks to the efforts of a group of Bostonians who wanted to provide “the advantages of a public library. 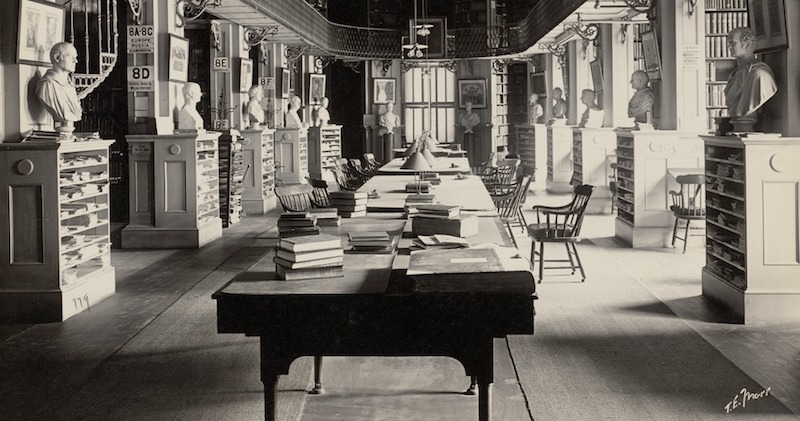 . . containing the great works of learning and science in all languages.” Over the past two centuries, the Athenaeum’s collections have grown exponentially as it acquired rare books with a special focus in New England state and local history, as well as English and American literature. If you’re a lucky local with a membership (these will run you anywhere between $210 and $305 per year), you can visit any time the library is open. If you’re a non-member just in town for the weekend, you can only access the space from 10am to 4pm on Saturdays. If you come early enough (11am), you can join a tour that explains the architectural history of the building and its special collections. Chances are, you’ve read the children’s classic Make Way for Ducklings (or you’ve babysat for someone who has). 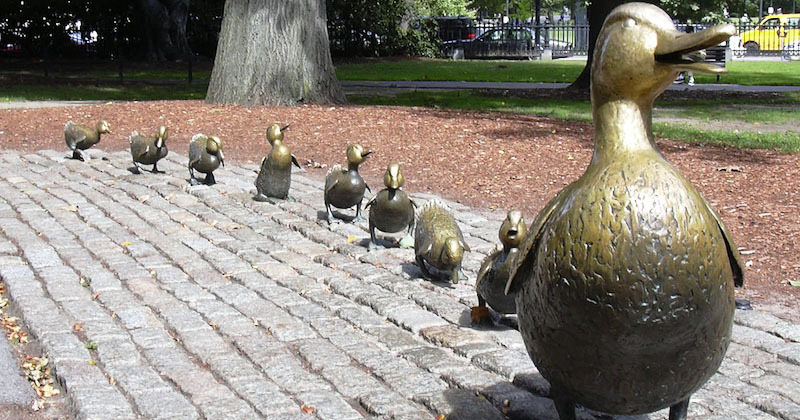 Scattered across Boston’s Public Garden, you’ll find author Robert McClosky’s bronze ducklings: Jack, Kack, Lack, Mack, Nack, Ouack, Pack and Quack. McClosky attended art school at the Vesper George School of Art, which has since closed; he wrote Make Way as an homage to Boston, despite moving to New York City after school. Find a bench to read, relax, and people-watch for a few hours. Grolier has been a cornerstone of Harvard Square since it first opened its doors to aspiring poets and masters of the craft alike in 1927. As the bearer of the prestigious title of “oldest poetry bookshop in the United States,” you might be surprised to find how intimate the space is (in fact, Grolier’s shares a building with the Harvard Bookstore, a used and new bookshop worth visiting for numerous reasons, not the least of which is to chat with its knowledgeable staff about what you should be reading next). 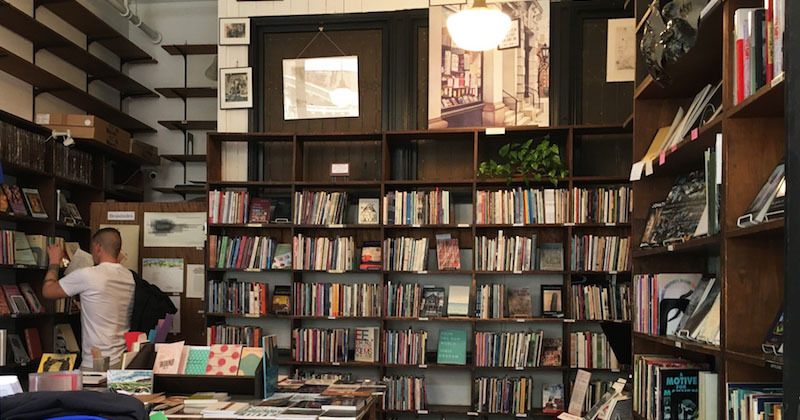 The current owner of Grolier’s, Ifeanyi Menkiti, a professor of philosophy at nearby Wellesley College, and his wife, Carol, are committed to preserving its mission as a place to discover and enjoy the art of poetry. The store has previously welcomed icons like e.e cummings and T.S Eliot, and still hosts readings regularly. The Plough and Stars has been around since 1969, and its cozy interior, slightly imperfect upholstery, and unpretentious bar suggests that its lived a pretty good life since then. The pub’s proximity to Harvard (and MIT, loosely) makes it a desirable meeting spot for faculty, and the $10 beer-and-burger deal is why it is coveted by students. There’s a vibrant live music calendar that tends to pack the place on weekend nights (though there are shows almost every single night). Don’t like the band? 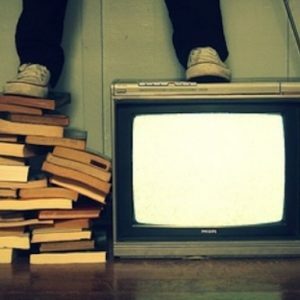 You can always find someone to talk to about what they’re reading (or writing) over the music, if you so choose. Or strike up a conversation with the bartender: they’ve seen Harvard develop through the ages, and have a story or three to share. Oset Babur is a writer and editor from Cambridge, Massachusetts. She currently writes and does all things digital at Harvard Magazine, and her work has previously appeared in VICE, McSweeney's Internet Tendency, GQ, and elsewhere. You can follow her on Twitter @baburoset, and find more of her work at www.osetbabur.com.